The Brick and Latics are on track to reach their target, this season!	" The Brick and Latics are on track to reach their target, this season! The Brick and Wigan Athletic joined forces, once again, this season to look to raise an incredible £100,000 towards The Brick Works helping to secure the charity’s long-term future. Since the launch of the partnership, just four months ago, The Brick can reveal that due to generous donations from Wigan Athletic, Latics fans and individuals, families, community groups and businesses across Wigan and Leigh, that they are well on the way to smash their target, which will help them to secure the future of The Brick. In addition to the money raised, 153 hampers were donated to families, who needed it most at Christmas, across Wigan and Leigh. The generous donations of food, toys, Christmas decorations and treats helped 473 people aged from 2 months to 75 years of age, and far exceeded The Brick and Latics expectations. 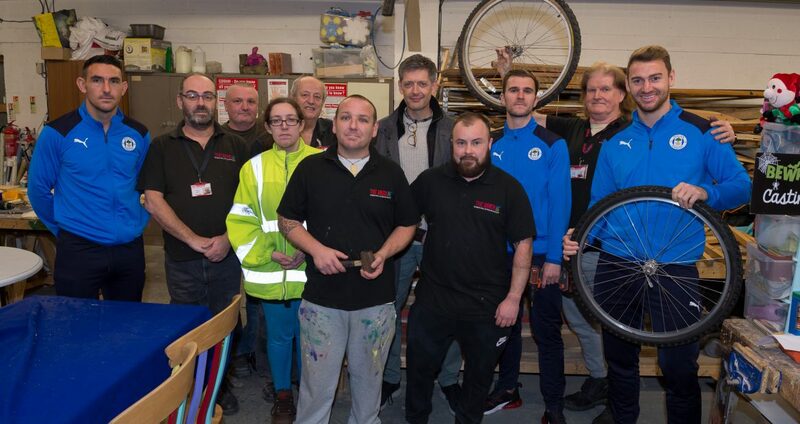 Ged Bretherton, Business Director at The Brick, said: “We were really excited about the prospect of teaming up again with Wigan Athletic to be their Charity of the Year and to work together to raise the funds to buy our Brick Works building. “What we did know is that we could count on the support from Wigan Athletic and from the wider public and businesses from across the Borough. We have been blown away by the generosity of people and the genuine interest in how everyone can help us to erase poverty and help some of the most vulnerable people in the Borough. This culminated in the huge donations of food, clothing and gifts for Christmas which was amazing. Jonathan Jackson, Wigan Athletic Chief Executive, said: “We’re enjoying another successful partnership with The Brick this season and the work carried out by the charity and the football club has been really pleasing. “A number of events have taken place, with particular highlights including the players’ involvement in various activities, service users of The Brick visiting the club’s training centre for Christmas lunch during the festivities and supporters giving generously to the charity’s donation drive on home match days. The Brick has also seen an increase in the number of volunteers looking to offer their time and skills across all the services that The Brick provide, with a significant increase in interest from new volunteers at the Wigan and Leigh night shelters. Fiona Robinson, Volunteer Coordinator at The Brick said: “As Volunteer Coordinator I have seen a massive increase in volunteer enquiries coming through, so much so I now have a dedicated volunteer assistant Larry who is helping me get through all the applications. The Brick provide a safe, solid building block for people in crisis to begin to construct a new life and become valuable members of society. If you would like to get involved with future Brick events, to donate or to volunteer at The Brick call 01942 417290.